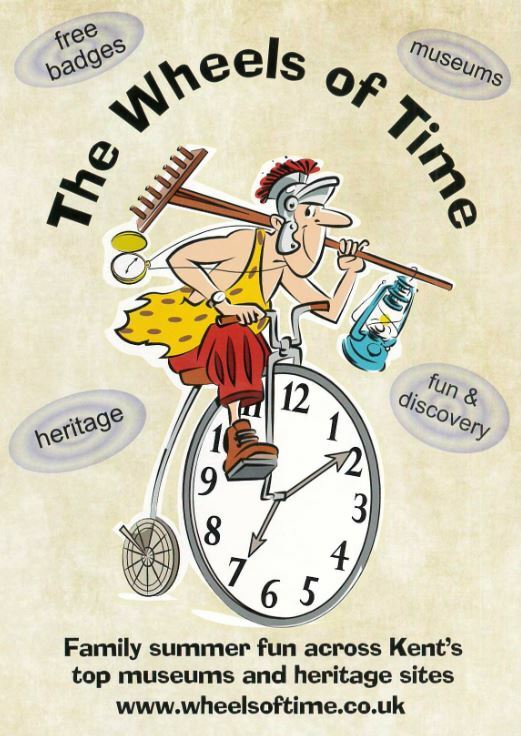 Wheels of Time is a badge collecting scheme encouraging the exploration of 33 Kent heritage sites for 5-11 year olds. Join Roamin’ Rex, our time travelling character, as he discovers Kent’s fantastic museums and heritage sites. Roamin’ Rex is on a mission to learn about Kent by following his trusty Wheels of Time map to different places. Why don’t you join him, and pick up each one of the 33 exclusive badges along the way?! Children aged 5-11 visiting any of 33 Wheels of Time venues will be given a different badge at each site, showing the site’s logo or related picture. A map featuring the Wheels of Time mascot, ‘Roamin Rex’, guides children to all of the sites. Children can ask for a lanyard, to display their collection, when they visit their second site. Children who have collected 10 badges will be awarded Roamin’ Rex’s ‘Bronze Award Badge’, those that have 20 badges will receive a ‘Silver Award Badge’ and those that collect all 33 badges a special 2018 Wheels of Time Award Badge. Wheels of Time is recognised as a Kent Children’s University Learning Activity, and many of the sites can give Learning Credits to children registered with Children’s University. Badges are FREE. Normal entry fees to each museum or heritage site apply - check on http://wheelsoftime.uk Some sites are free to enter but rely on donations from visitors; please give generously. Wheels of Time is a Kent Childrens’ University (KCU) Quality Assured Activity. Children registered with Kent Children’s University* can earn learning credits at registered sites. KCU registered sites are marked on Roamin’ Rex’s list of Museums and Heritage Sites. If the site is Validated and listed on the Wheels of Time website, CU website map/App, there will be activities available onsite and the venues will issue 2 Learning Credits. These are the support materials for those NON-Validated Wheels of Time sites. The Children's University™ (CU) aims to promote exciting learning opportunities and experiences outside normal school hours for children aged 5 to 14. At the heart of its work is the ambition to raise aspirations, boost achievement and foster a love of learning, so that young people can make the most of their abilities and interests. You do not need to have a Facebook or Twitter account to view the pages. These pages are for school staff and parents. “Wheels of Time” ®, “Roamin’ Rex” ® and the Roamin’ Rex logo are trademarks of Ashford Borough Museum Society.